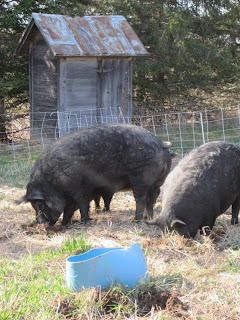 The pigs were so excited to get some grass the other day that we decided to find a temporary spot for them to graze and dig until the pastures are ready for them. Although I had decided not to expand our garden this year until I knew we'd have time to plant it, I couldn't resist the thought of how happy the pigs would be to get a jump start on the grazing season. So we fenced off an area for them to plow up for us. It was worth it just to see their happy digging.